Dig it: Brian Eno & David Byrne’s new rekkid drops soon, and the first single is good. Download it here. Blatant promotion, and unpaid, too. But – I have history: 1988! 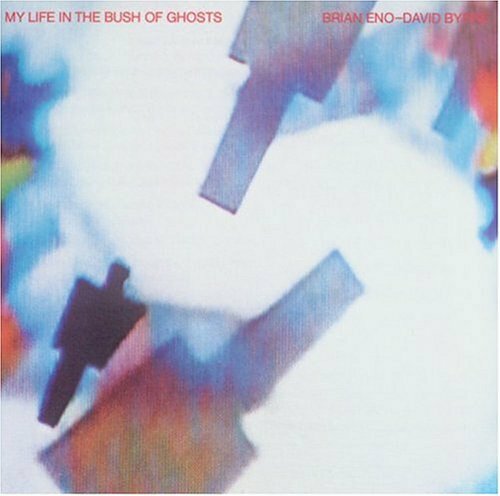 I bought the cassette of B&E’s My Life in the Bush With Ghosts (1981), I’m guessing from the dollar castoff bin at Sam Goody’s at the Rockaway Mall (NJ), and did so for its title and cover alone, really, although I admit I was getting into Eno heavily at the time after lucking into his Apollo soundtracks, and of course I was already well-acquainted with Talking Heads. MLBWG didn’t go over too well in the car when friends co-rode with me. I was punched in the back of the head a few times, and possibly forced to play Iron Maiden. I don’t know where he is today. He remains one of my better ghosts. Posted in My Life in the Bush with Ghosts. Unfortunately for me Camaros blasting Samantha Foxx are something I could easily see on a daily basis.